From the producers who bought you Lone Survivor and Escape Plan, comes this action-packed offering featuring an all-star ensemble cast, including action legend and Golden Globe Winner, Bruce Willis and BAFTA nominee John Cusack. Retired New Orleans crime boss and widowed father Paul, (Patric) is forced back into the life he gave up when his daughter Beth (Gia Mantegna: The Frozen Ground) suddenly disappears from university. When Beth’s friend Angela (Jessica Lowndes: 90210) points him towards a violent gang led by notorious drug dealer The Pharmacy (Curtis "50 Cent" Jackson: The Frozen Ground), Paul soon discovers that his daughter’s disappearance is personal. He enlists the help of his best friend Sam (Cusack) to help rescue Beth from former rival Omar (Willis), a man determined to have his revenge for the death of his own family. 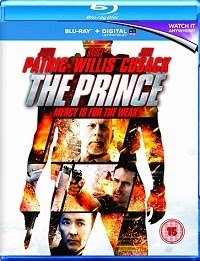 If Paul has any chance of keeping his daughter safe, he must combat old enemies and confront his own violent past; a time when the crime world knew him as “The Prince”.